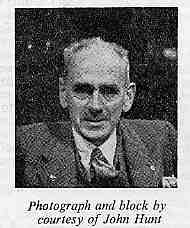 One of the pioneers of rough stuff cycling was Walter MacGregor Robinson, who, writing under the pen-name of Wayfarer, commanded a devoted band of followers in the years following the Great War. To capture the flavour of those early days we publish below a typical article by Wayfarer describing the conquest in wintry conditions of one of most challenging and beautiful passes in mid-north Wales, Nant Rhyd Wilym in the Berwyn Mountains. This pass is still associated with Wayfarer and has a stone inscribed to his memory at its summit. 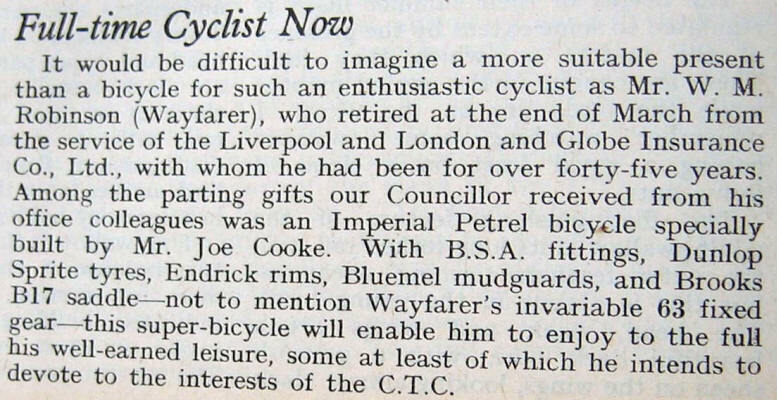 For further information about Wayfarer click here to see a tribute to him published in Cycling in 1972 and here for information about the memorial stone and links to Rough Stuff Fellowship groups. 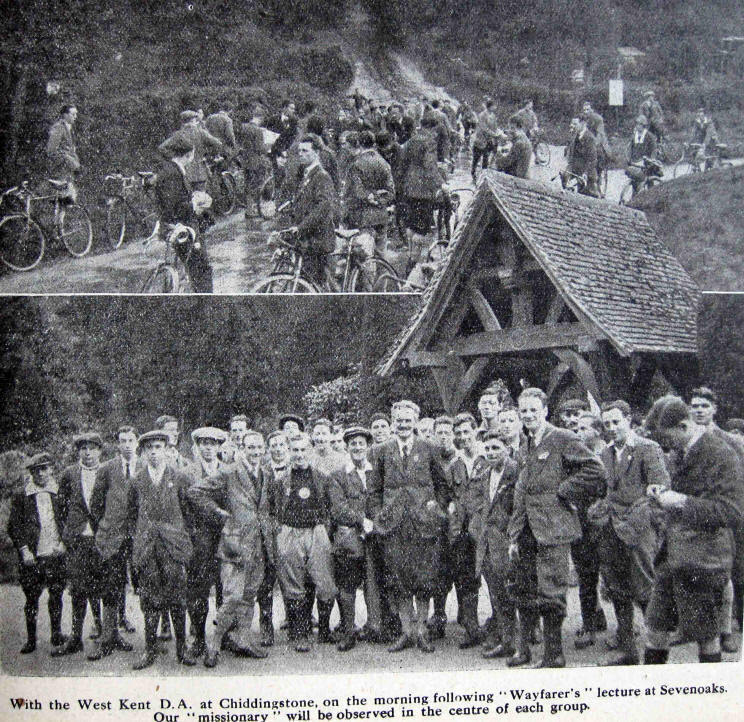 Reproduced from "CYCLING" dated 8th May, 1919, by permission of the Editor of Cycling. Just as I celebrated the departure of "the Season" last September by means of a cycling week-end trip, so I celebrated the end of the "off-season" in March by a cycling (and walking) week-end trip. I am, indeed, a bit of a stickler for observing these feast days and holidays, deeming it fitting that, when the "sensible cycling season" comes to a close, one should note that fact in a proper manner, just as, on the passing of the "off-season" (when "nobody rides for pleasure"), one should do something special to mark the event. Homage from one former Merseysider to another. 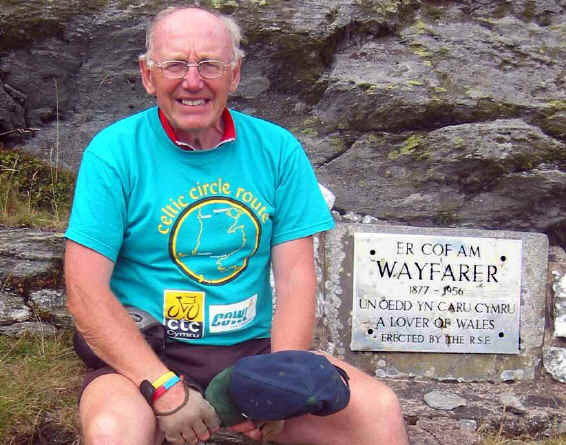 Roy Spilsbury, CTC Cymru, pays tribute to a legendary cyclist. The latter guess is the correct one. From high ground on the Welsh marches a comrade and I stopped and looked far across the Cheshire Plain, noting here the bluff headland at Helsby, there the picturesque hill on which rests Beeston Castle, and yonder the snug little city of Chester through which we had ridden an hour before. We noted, too, that here and there earth and sky were connected by a grey smear, and we knew that somebody was "getting it in the neck". Subsequently, at our destination, one or two of those somebodies joined us, disguised as Father Christmas. They reported passing storms of snow and hail, through which they had ridden -a pleasant change from the monotony (?) of sunshine cycling. So, after tea, four of us set forth for the Glyn Valley, where we intended to lie for the night. We disposed of Wrexham by means of an avoiding loop (of which I wrote something a few months ago), and the poisonous and tramlined main road beyond was similarly dealt with, pleasant lanes carrying us into Ruabon. Here, long past the Defence of the Realm lighting-up time, our lamps were lighted, and thereafter we tumbled down through Newbridge into the Dee Valley and climbed up again to Chirk, where we turned off the Holyhead road and set forth on the last stage of our journey. The road up the Glyn Valley for the first few miles has been "repaired" in a manner which suggests that the local authority wishes to discourage cycling and motoring visitors, upon whom the prosperity of the district in a measure depends, but with the aid of two acetylene lamps we managed to keep clear of the numerous patches of stones which have been dumped down in higgledy-piggledy fashion. The little River Ceiriog, which keeps close company with the road, intrigued us with its full orchestra, and overhead, in a clear sky, a brave show of amazingly bright stars added to the evening's entertainment. One great star in particular - Venus - attracted our attention. We almost imagined it to be an arc lamp on a near-by hill. that down went our pace to little more than that of a pedestrian. A grey pall blotted out the starry display which had rejoiced us coming up the valley, and under these conditions we completed the last few miles of our ride and reached Llanarmon-Dyffryn-Ceiriog. The original Wayfarer stone (featured here) was replaced by the stainless steel one after vandalism. 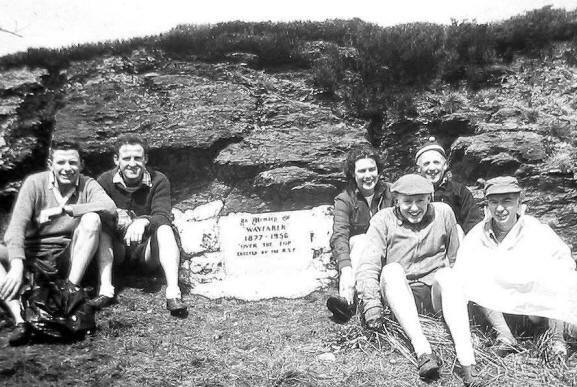 Here we have Liverpool youth hostelling cyclists in 1956 arriving at the summit after a torrential downpour. Rejecting the more elaborate comforts of "the room", we foregathered in front of the roaring fire of the inn kitchen - a kitchen that would delight the heart of Frank Patterson (this was the simultaneous thought of each of us) with its brasses and pewter, its bench, its old table and chairs-and there we supped and yarned. It was the plan of three of us on the morrow to attempt the passage of the Berwyn Mountains - to scale the lofty and rugged barrier which lay between us and the Valley of the Dee - and we were in some doubt as to the feasibility of such a trip so early in the year. Conversation on the subject with our hostess afforded little encouragement or comfort. The crossing was out of the question, we were told. One of the villagers who had attempted it a few days before had had to give it up. During the week a woman, anxious to visit a sick relative in the next valley, had been imprisoned in a snowdrift up the mountain side, and was providentially rescued alive the following day. Our prospects of getting through to Corwen were not very rosy, but we suspended judgment till the morning, and, advancing our watches in accordance with the Summer Time Act (Heavens! "Summer" Time! ), we found that it had suddenly become midnight, and went to bed. The little window of my bedroom stood wide open (which was as it should be) and the snow was blowing in. I knelt on the broad casement and looked out. It was still snowing-but feebly. The stars had asserted themselves again in all their wonder and brightness, and I opined that the storm had nearly passed. Right opposite to me 1,500 feet of mountain upraised itself, clad in ermine. Immediately above me the inn sign swung to and fro in the wind, droning its changeless song. Below me, just across the road in front of the inn, a small and altogether unimportant tributary of the Ceiriog bustled noisily over the stones and scampered off to "join the brimming river". The track we were to follow crosses the Berwyns at an altitude of some 1,700 feet above sea-level, I reflected. Would our journey to-morrow be possible? Then I remembered that, thanks to our "intelligent anticipation" of an Act of Parliament, this was already to-morrow, and two minutes later I was in bed fast asleep. It was snowing when I got up at 8 o'clock, but clearly this was a new effort, for no depth of snow lay on the road. I took a walk up the hillside before breakfast and returned to find the Old Gentleman looking over our machines. He at once began to pump his views into me. "I think", he said, "that they're exaggerating the condition of affairs on the mountain. Things aren't as bad as they say .... I think we might venture. What do you say?" I decided that what was good enough for him was good enough for me, "and anyhow", I added, "'twill be an adventure". The Choirman took the same view, and so we sat down to breakfast with our minds made up, our hostess still dwelling on the impossibility of the crossing. "We'll take our chance", I said. "Violets are my favourite flower-and nobody to go into mourning, please". We had a fair enough start, the sun shining as though it were Midsummer, and the sky of a clear blue so far as we could see it. And thus we were lured to our fate. We rode quietly up the narrow lane that leads to the mountain, following one another in single file, and then, when we were fairly on our way, a shutter slipped over the sun and it commenced to snow heavily! There was but one possible course for us to pursue. We "carried on", hoping that the snow would be nothing more than a passing phase. This proved to be the case, and by the time we became pedestrians the storm had blown over. and consented to let us through. One other gate we managed to force sufficiently open to pass our machines through, but the rest of them were blocked by deep drifts and immovable, and we had perforce to life our mounts over and scramble after them. Keeping close to where we thought the track to be, we picked our way as well as possible, now on this side and now on that, sometimes sinking into the snow up to our knees, and occasionally carrying our machines over a drift. The worst disaster that befell us was when the Old Gentleman, who was leading the procession at the time, travelled part of the way through to New South Wales. The snow suddenly gave way, and only the upper half of him remained to us. When he considered that the "joke" had gone far enough - and told us so, with emphasis - we pulled him out again. In spite of all our difficulties - and it was no easy matter to fight our way through the snow and against the brisk north-wester - we had time to admire the wonderful world in which we found ourselves. Everything - or nearly everything - was pure white, which glistened in the sun and dazzled us. As we neared the ridge we found the wind had a curious effect on the snow, which looked for all the world like the ruffled sand of the sea-shore when the tide goes down. Our crowning joy came on rounding a bend at the highest point. Then we glimpsed that promised land. The mountain side fell away and rose again, and in the misty distance we saw the snowy peak of a great fellow thrust up to the clouds. The nearer mountains were wrapped in what looked exactly like satin coverings. A question arose as to the way, but, on arriving round a shoulder of the hill, we saw far below us the snowposts which were our sufficient guide. Afoot - for cycling was impossible - we reached and passed the posts, and felt that our difficulties were over. Vain thought! Walking was still the order of the day, and further on we came to the worst drift we had yet encountered. Further still, we found that a single wall first and double walls later had acted as a revetment. The snow of probably all the winter had been successfully penned up - the bare mountain side close by indicated whence the supplies had come - and, fortunately for us, had frozen hard. We walked over the snow almost on a level with the top of a six-foot wall. If the snow had been soft, I think that we would have had to return the way we came, thus acknowledging defeat. One or two more recalcitrant gates followed, and then we found ourselves below the snowline. A fine view into the Vale of Edeyrnion, with the pleasant village of Llandrillo and stretches of the swollen Dee in sight - a tricky drop (still down the mountain side) into Cynwyd - three miles of main road - Corwen - lunch. Our journey of some ten miles had occupied exactly four hours, and we reached Corwen at 1.30 p.m. as per schedule! but we decided to chance it - to face such risks as there were, and, in the event, our enterprise, or courage, or folly, or whatever you like to call it, was rewarded. "But was it worth it ?" cries somebody. "And is this your conception of cycling ?" asks another. An emphatic affirmative reply is given to both questions. Was it worth it? 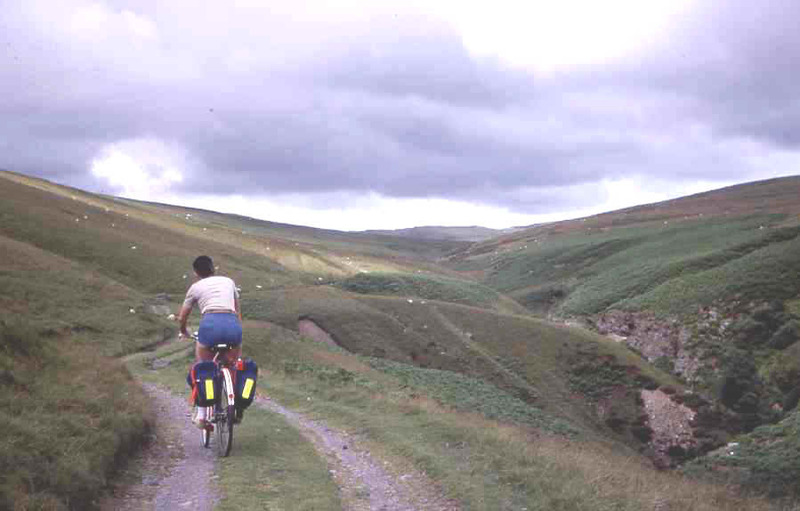 Well, last August I crossed the Berwyn Mountains by this same route, but in sunshine and shower - chiefly shower, and more than shower. I am glad to have made the crossing in more or less easy and more or less normal conditions, but it is an infinitely more interesting and adventurous trip when done in deep snow. Normally, this journey over the top is well worth doing, for there is much to be seen. When, however, you add snow to the picture, the result beggars description* and I am more than glad - I count it a privilege - to have crossed the Berwyns on a "white" day in March. And is this cycling? Per se, possibly not altogether. Some of the way over the mountains was ridden, but for the most part it was a walking expedition, as has been made clear. It should be emphasized, however, that only through the medium of cycling was the outing in any way possible. Prefaced by a 60-mile ride and followed by one of nearly 50 miles. I claimed that, broadly, this is cycling. At least, it is cycling as I understand it, for my conception of the pastime includes much besides main roads and secondary roads and much beyond the propelling of a bicycle. And, though I am almost a "one-pastime man", I fling wide the boundaries of that pastime and include whatever is incidental thereto. Some of the best of cycling would be missed if one always had to be in the saddle or on a hard road. Of the return journey I have hardly room to speak. It was an adventure in itself. We ignored the main road along the Vale of Llangollen and travelled on the hill (or mountain) road via Llandegla. Ascending to an altitude of 1,000 feet, and afterwards one of 1,100 feet, we found all the snow we wanted. A wide area around the high-up village of Llandegla was deeply coated with snow. Underneath was a surface of we knew not what - frozen ridges of mud, ice, loose stones. East of Llandegla lies a charming little moor over which the road climbs steeply and drops steeply. That fall was something of a nightmare, and we each had a sufficient ration of front wheel skids to last us for years. In one part the Choirman lured the Old Gentleman on to the "best" part of the road, and the Old Gentleman incontinently lay down in the snow and the Choirman rode over one of the wheels. I myself, when nobody was looking, experienced the pleasure of being flung off - and then I gave an encore. Snow choked the mudguards and clustered round the rims and hubs. Snow thrashed down from the sky and lashed our faces and tried to get down our necks. But an end comes to all things. We tumbled down-hill to lower levels where the snow had melted as it fell, and, encouraged by the prospect of a very belated tea in Cheshire, began to "get 'em round" to some purpose. Thus, at the end of the "off-season" for cycling, we went over the top and obtained all our objectives. 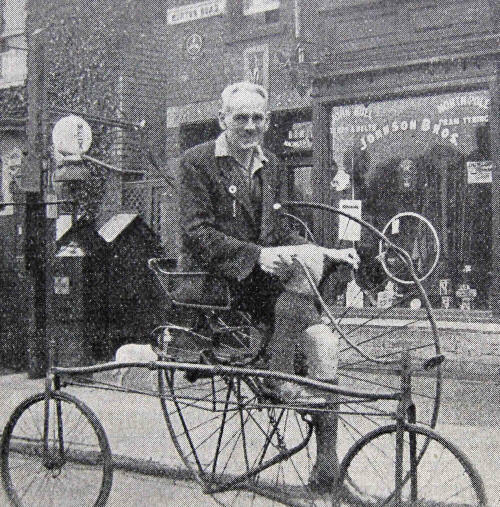 A picture taken c1931 of Wayfarer astride a Coventry Lever Tricycle. Note the CTC Winged Wheel sign on the wall. This machine was first produced in 1878, the same year as CTC was founded.